Cigar Throttle | Light. Load. Lock. Ride. As a cigar lover, when was the last time you were able to light up with your cigarette-smoking buddies on a quick rest stop mid-ride? Cigarettes smoke fast and you’re left holding a quarter-smoked stogie while they’re saddled up and ready to move on. Or maybe you’re eighteen miles into your Monument Valley ride and really wishing you could smoke your 4pm cigar. 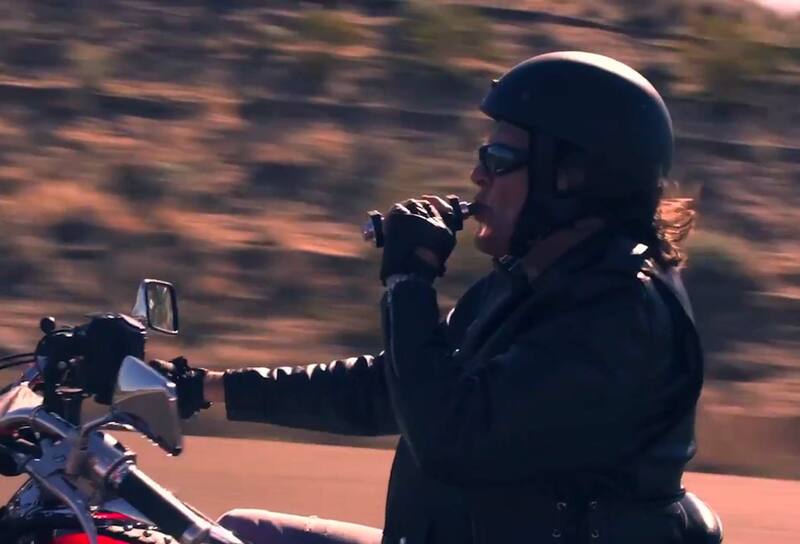 The Cigar Throttle is billet aluminum designed to let you smoke on the road. The machined sleeve encases the lit cigar, protecting it from the wind and encapsulating it along with the ashes. Continuous, controlled airflow keeps the cigar burning evenly and lit. Light the cigar and take a few puffs to make sure it is burning well. Load your cigar into the Cigar Throttle through the opening. A fully loaded, 6-inch cigar will have about 1.5 inches of the cigar protruding out of the mouth end. Lock it down – push the lock ring until you hear a “snap”.  This means the collar has engaged the bearings and they have gripped your cigar. Take a few puffs and place the Cigar Throttle onto your clean steel tank. The motion of the bike will provide enough airflow to keep your cigar burning until you are ready to stop smoking, so get moving as soon as you can safely do so. Cigars burn down like crazy on the road because of wind speeds. 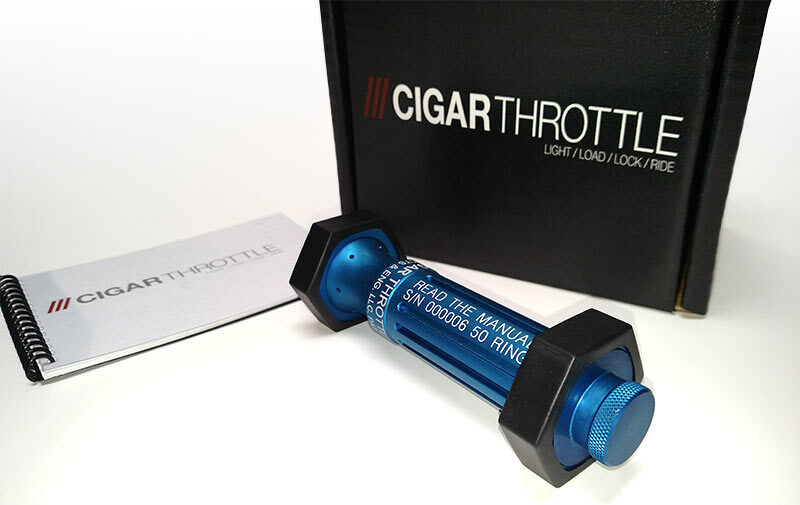 With Cigar Throttle, our testing shows 45 minutes-1 hour burn time. About the time it would normally take to smoke it. If you smoke and ride, you’ve invariably had hot ashes fly into our face or burn holes in your jacket. 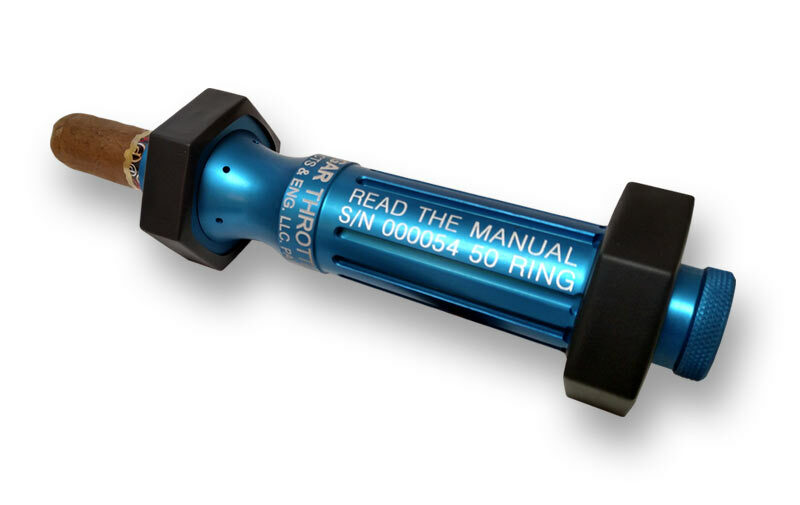 The Cigar Throttle collects ashes in the tube, which you can empty at the end of your ride. Do you hold cigars behind the windshield? Behind your knee? Riding is tough enough – it’s important to have two hands free. 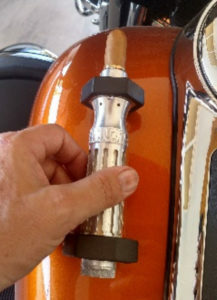 The Cigar Throttle magnets snap to your gas tank between puffs. The wind is hell on cigar wrappers. 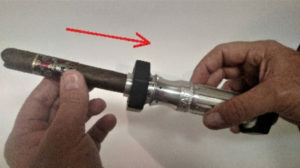 But Cigar Throttle’s machined sleeve guards against the breeze and keeps your stogie from completely unraveling. Still curious? We've got your answers. Wondering about putting a lit cigar so close to your gas tank?  It won’t be an issue as long as you don’t leave a lit cigar in the Cigar Throttle while refueling or near gas fumes (like from a loose gas cap). 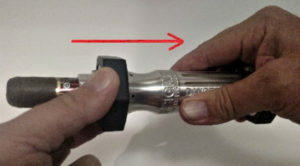 Also, don’t use the Cigar Throttle on any equipment with a leaking fuel system. I’ve spent my whole life designing, drafting, and engineering, both professionally and personally, so I came out of that conversation thinking, “There’s a way to do this.” And I got to work. Fast forward to today: the Cigar Throttle is made from machined billet aluminum and contains some small parts made from nickel-plated or stainless steel. There are neodymium magnets embedded in both ends that have a rubberized coating to protect your paint. If you’re interested, our US Patent Number is 9609892.  The Cigar Throttle has been in the works for over five years: testing, iterating, engineering, and perfecting, and I’m so ready to get it into the hands of riders. I hope it makes your rides as fun as mine have been. Special introductory pricing for a limited time only! Save $60 while this sale lasts! The Cigar Throttle is designed to eliminate a multitude of problems by encasing the lit cigar in a sophisticated, machined aluminum sleeve that protects it from the wind and encapsulates it along with the ashes. 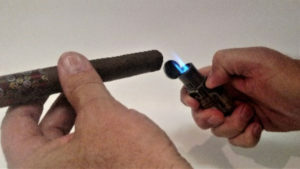 Continuous, controlled airflow that is speed adjustable keeps the cigar burning evenly and lit. 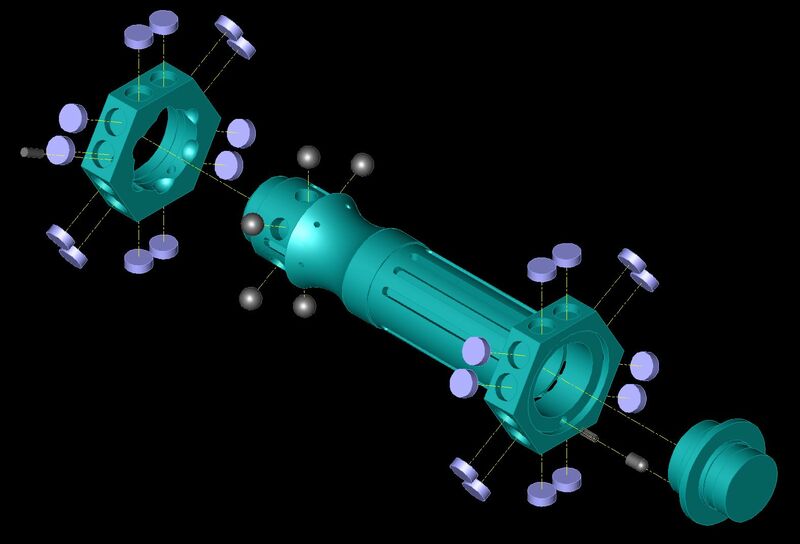 It is attached to a steel tank by powerful neodymium magnets encased in a protective rubberized coating. So, no need to worry about scratching the paint.  Whenever the rider wishes to take a puff, it is easily picked up and placed back down freeing up the hands to operate the bike controls. For warranty information, click here. Free shipping across the continental USA! A special thank you to the people who funded our Rocket Hub project!